This is a crazy adorable bag! It would certainly get people asking if I have chickens - which I don't (yet!). I'm part of a grassroots movement to get backyard chickens legalized for downtown dwellers. Carrying the Henbag around town would not only show my support for our group but would definitely invite questions about chickens... and I'm always up to promoting chicken ownership! That would be the perfect bag for me to carry when I start my new career as a farmer! OK, not in the barn, but when I hit the farm store for feed and hardware! I collect chickens and chicken items, and even have sixteen of my own. I have always wanted one of these. I plan on using it for my church bookbag if I win it. A heartwarming chicken story I have is that when my mom was dying in the hospital, I took a break and went to the gift shop to St. Francis Hospital. I saw this huge breathtaking antique ceramic barred rock. Barred rocks are my favorite chicken breed and I asked the woman if it was for sale. The woman said yes...and that the gift shop staff referred to her as Big Fluffy. I have a feeling these ladies didn't want to really let her go but I told them she was going to get a good home. I even started a Facebook page for her, plus, she will be featured in an online magazine next month, Toil The Soil. I didn't have the money for her though so I went away in tears, but my mom allowed me to go ahead and buy her from her account. My mom passed away a few days later so Big Fluffy is the last thing my mom ever bought for me. Big Fluffy has a place of honor in the middle of my mantle, along with some other prize pieces from my collection. I think this henbag would be cute to carry around and I might even get creative and do a few photography sessions with my chicks and the henbag if I win it...would be too adorable. Good luck to everyone else! I have this bag. I absolutely love it. Whereever I go, people stop and ask me about it. Whoever wins it better like talking to people about chickens because it is definately a people stopper! That hen bag reminds me of my own beloved Dixie, a Sicilian Buttercup hen. She has big, brown, beautiful eyes and just so happens to love purses! Every time I or my daughter put our purse on the floor, Dixie has to investigate the contents. Dixie would love it if I had a hen bag. I could put my photo keychain of Dixie on the handle, and when I am out and about, people would surely comment on the lovely bag! We love chickens so much, we took one of ours on vacation with us! You can read about his adventures here: http://www.familiesontheroad.com/life/pets.html just scroll down to about the middle of the page and you will find out about our little Chicken On The Road! 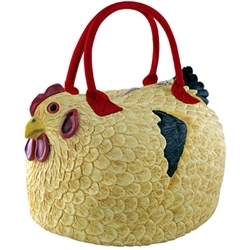 I love my chickens and I love cute purses- and this is so much better than sticking a chicken in your purse (which I did before). This purse lets you have the best of both worlds without reaching inside for your wallet and having your chicken pop out for quick run around the store. Also the henbag won't poop in your car then demand half of your french fries when you stop at the drivethru. Can't think of an accessory that would go better with barn boots and jeans than that purse! That is so ridiculously wonderful! I need that bag! love the Henbag! most times I just see rooster stuff. my hens are out and about scrathing and pecking. and happy its spring, and my baby ones are coming next week! yipeeee,an old hen with a henbag would be would scramble peoples minds lol. What a functional accessory like not other plus a great conversation piece. The one to carry this bag is going to get attention, comments and some will admire the uniqueness of this purse. Another added bonus is a benefit to vender from which it came from because you KNOW it will be asked, "Where did you get that?". Nothing better than something catchy and free advertising. If I were given this purse I would give it to my 70+ year old Mother who would most likely tote this everywhere from the Farmer's Market to the Mall.